Finally work and life have slowed down enough to let me update this. I am so glad the holidays are over. They just weren’t the same without my son. I got a couple of necklaces finished, but have decided to specialize in Cmas. ornaments-mostly drapes. They sell like crazy and are fast and fun to make. I’m waiting on a bead order that is supposed to arive Tues.. 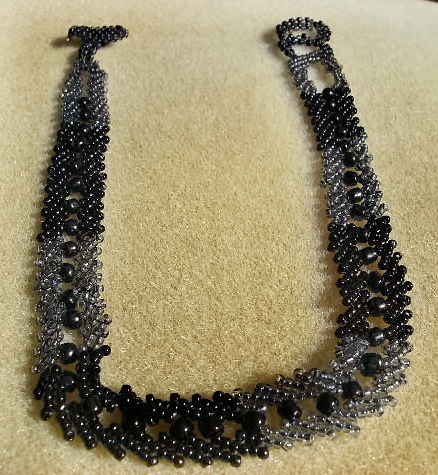 The necklaces I finished were both variations of a stitch called St. Petersburg. It’s a great stitch, but isn’t sturdy enough to do what I had intended, so I modified it and changed one into a choker and the other has a delicate fringed focal on it, like the earrings. I changed the color scheme, too. That’s all part of designing things, I guess. Ideas into realities turn into many modifactions. Or alternative uses. I don’t much care for New Year’s resolutions, but made 3 this year. Made 2 last year and accomplished one, so I figured I would try 3 and see what happens. One (and one I really want to keep) is to quit smoking this year. I used to enjoy it to a certain point, but now I’m tired of it. My husband and I go through 3 cartons a week, sometimes 4. That’s a lot of seed beads going up in smoke every month. Besides, I would like to bounce grandchildren on my knee one day. The 2nd resolution is to update my blog at least twice a week. The 3rd is to get more focused on marketng my jewelry. I know I can do 2 and 3, but the 1st one has me scared. If you have quit smoking after doing it for years and years, I will listen to any and all advice and suggestions. 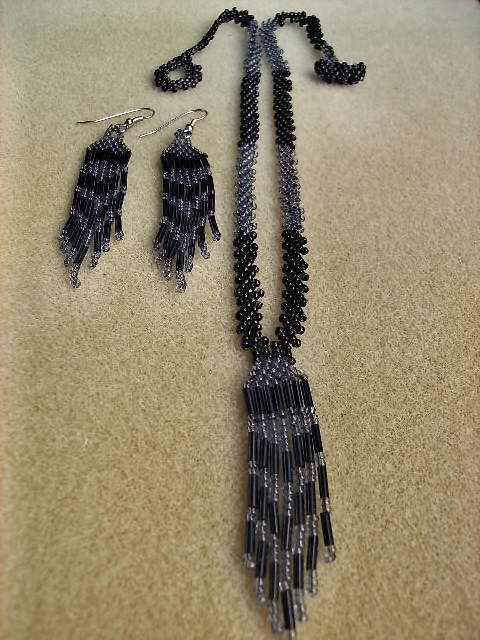 This entry was posted on January 13, 2008 at 1:6:40p01 and is filed under beaded jewelry, jewelry design, quitting smoking, seed beads. You can follow any responses to this entry through the RSS 2.0 feed. You can leave a response, or trackback from your own site. I haven’t used the St. Petersburg yet, it works up beautifully though. Then again, could be the artist!